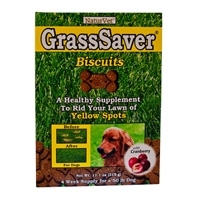 GrassSaver« is a healthy food supplement. This unique formula contains a synergistic combination of B-Complex vitamins and amino acids. Imagine how green your lawn can look. Simply feed GrassSaver« to your dog and rid your lawn of yellow spots. The bygone days of catching fireflies, riding bikes, and being home by dark may be behind us, but the memories and feelings are still very much alive. These were simpler times, when meals were made with love, patience, and wholesome ingredients fresh from the garden. 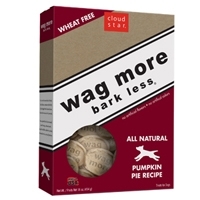 Wag More Bark Less dog treats were created to reflect the straightforward goodness of this era, with all natural, simple ingredients and no wheat. Bursting with great taste! Made with natural ingredients like oatmeal, real peanut butter and real eggs. For added nutritional benefits, they added apples and fresh ground carrots. Perfect for any dog, anytime. Bursting with great taste! Made with natural ingredients like oatmeal, Vermont cheddar and real eggs. For added nutritional benefits, they added apples and fresh ground carrots. Perfect for any dog, anytime. Made the Old Fashion way with natural ingredients like oatmeal, real boneless chicken and real eggs. For added nutritional benefits, they added apples and fresh ground carrots. Perfect for any dog, anytime. Old Mother Hubbard Bacon and Cheese, 12/5 oz. ur classic Bac'N'Cheez® bone-shaped biscuits are oven-baked with a taste of Cheddar Cheese & Hickory Flavor.